Rajasthan Pre Engineering Test (RPET 2014) Examination Notification is issued by Board of Technical Education, Jodhpur Rajasthan on 31st March 2014. 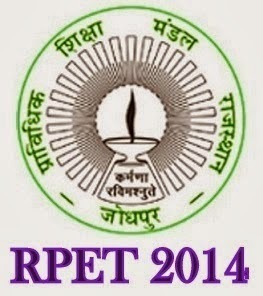 RPET Exam 2014 is annual examinations for admission in Engineering Colleges across Rajasthan. RPET Exam 2013 will be conducted on 21st May 2014 (Wednesday) from 09.00 a.m. to 12.00 Noon at the centers in the following cities : Ajmer, Alwar, Banswara, Barmer, Bharatpur, Bhilwara, Bikaner, Churu, Hindaun City, Jaipur, Jhalawar, Jhunjhunu, Jodhpur, Kota, Pilani,Sikar, Sirohi, Sri Ganganagar, Sawai Madhopur, Tonk and Udaipur. Board of Technical Education, Jodhpur Rajasthan issued Official Notification of Rajasthan Pre Engineering Test (RPET) - 2014 for admission to first year of undergraduate programmes leading to Bachelor’s degree in different disciplines of Engineering (B.Tech. / B.E.) in various Govt. aided and Private unaided technical institutions of Rajasthan (except BITS Pilani, MNIT Jaipur and other Deemed & Private Universities) for the session 2014-2015. Educational Qualification: (i) The minimum academic qualification for admission to B.Tech./B.E. program in Rajasthan is a pass with atleast 45% marks (40% marks in case of candidates belonging to “SC/ST/ Non Creamy Layer OBC/ Non Creamy Layer SBC” of Rajasthan state) in the subjects combination as given below taken together, in the final examination of 10+2 (Class XII) of Board of Secondary Education, Rajasthan or any other examination recognized equivalent thereto by Board of Secondary Education, Rajasthan/ Central Board of Secondary Education (CBSE). (ii) Subject combination required in the qualifying examination for admission to B.Tech. / B.E course shall be as under: Compulsory Subjects: Physics and Mathematics, Any one of the Optional Subjects: (1) Chemistry (2) Bio-technology (3) Computer Science (4) Biology. Candidates appearing in the qualifying examination (10+2) in 2014 may also apply. Age Limit: Only those candidates whose date of birth falls on or after October 01, 1989 are eligible. However, in the case of Scheduled Caste (SC), Scheduled Tribe (ST) and Physically Handicapped (PH) candidates, upper age limit is relaxed by 5 years, i.e.SC, ST and PH candidates who were born on or after October 01, 1984 are eligible. Date of birth as recorded in the Secondary Education mark sheet / certificate only will be taken as authentic. Exam Pattern: RPET-2014 shall consist of single examination of three hours duration containing 40 objective type questions in each subject i.e. Physics, Chemistry and Mathematics. The total no. of questions will be 120 carrying one mark each. There will be no negative marking for wrong answer. The questions in the test booklet will be both in Hindi as well as in English. How to Apply: Students are required to fill Online Application form from the following given official website i.e. http://techedu.rajasthan.gov.in OR www.rpetexam.com OR www.rpetexam.org. After submission of online Application form, candidates need to take print out of system generated Application form and then Attach all required documents as mention in checklist given in General Instructions . At last send it to following address: The Coordinator RPET-2014, Board of Technical Education, Rajasthan, W-6, Residency Road, Jodhpur – 342032 by 21st April 2014.